William Morris Calendar – Give-Away Winners! Did you sign up for the William Morris in Appliqué give-away? I’m excited to announce the two lucky winners this morning! For the winners, and some information on upcoming stuff on Needle ‘n Thread, read on! Thanks again to Country Bumpkin for the calendars for the give-away. 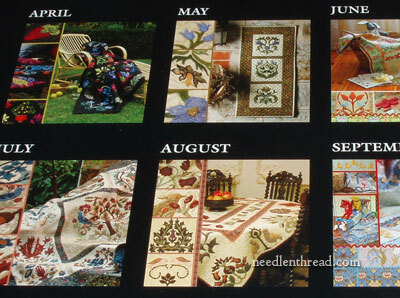 If you didn’t win, and you’re keen to have one of these beauties in your sewing room, you can pre-order the William Morris Appliqué Calendar for 2013 now, through Country Bumpkin. 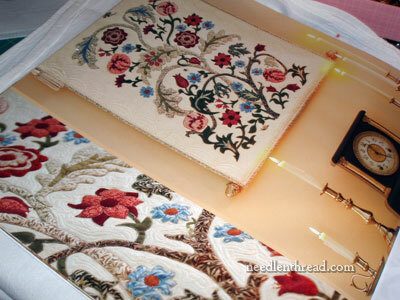 It would make an absolutely perfect Christmas present for the quilters in your life! Carolyn Grill, with this reply to the give-away question, What technique would you like to see featured in a 12-month calendar? Congratulations, Carolyn & Elisabeth! Please contact me with a mailing address so I can get these out to you as soon as possible. I’ll try not to make any rash commitments here, in case it ends up being another wonky week! But I always figure accountability and commitment begin by saying it out loud, so … here goes! This week, you’ll get a book review of an adorable book (quilters and lovers of redwork will be enchanted!). You’ll also see some progress pictures on a current project involving embroidery in silk on linen, and the set-up of this Hungarian redwork project, which I’ll be showing in intervals as it progresses over the next couple months. And I’d like to squeeze in a little stitch instruction, too. Just a little mucking about with thread, you know! Stick with me for an absolutely titillating week! October 17, 2012 William Morris Calendar – Give-Away! Hearty congratulations to Carolyn and Elisabeth. Well done ladies. Enjoyed your answers too. I read a lot but didn’t get though all of them. Was a really interesting question. The mind boggles just to read what you set for yourself Mary. Lucky us! Looking forward to al,l and maybe the wee projects the most. Congratulations to Carolyn and Elisabeth I hope you both enjoy the calendars and thanks Mary for your give away so generous. Can’t for the to see your current stitch project and excited abouth the tool give away and for instructions on the Lavendar Honey. Love your site.